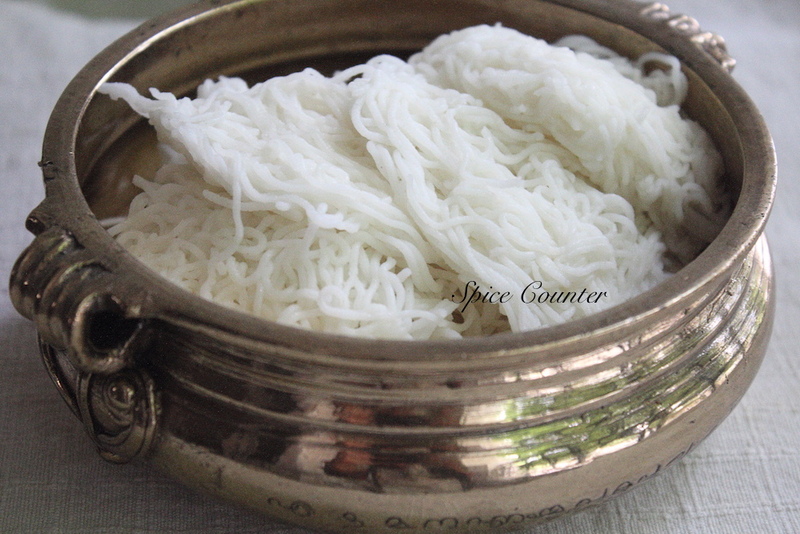 Idiyappam or String hoppers as I know it is a dish that has evolved in the south of India (Kerala and Tamil Nadu). It is basically noodles made using rice flour. Dough made of rice flour and water is passed through an idiyappam maker or string hopper maker (like the pasta machine). The noodles are then steamed to perfection before it is served with sweet or savory sides. In my household it’s generally served with vegetable stew or egg curry or sometimes it is just had with sweetened coconut milk. My early memories of the dish involve my mother, sister and myself huddling in the kitchen trying to crank the not so user friendly Idiyappam maker around so that the lovely rice noodles is pushed out from the other end. It is easier to make it at home these days. The modern day contraptions are easier to use and I look at it as a good way to get a workout for the fingers and arms. The quality of the String Hoppers depends on the quality of the rice flour and also on how soft the dough is. If you let the dough dry out, then the string hoppers will also be dry in texture. Generally when I make the dough I rub some oil on the dough and wrap it a wet cloth. This way it doesn’t dry out fast. My mom and I use Nirapara brand of Idiyappam Powder and we are satisfied with the results. So without further ado, here goes the recipe for String Hoppers. Add rice flour, oil and salt in a bowl and mix well. Add hot water and immediately start mixing it with a wooden spoon. Keep mixing it till comes together and a dough is formed. Grease the insides of the Idiyappam maker. Take a small portion of the dough and put it in the idiyappam maker. Squeeze out the stringy idiyappam onto a greased plate which can be put in a steamer. Steam for 10-12 minutes on high flame. The dough should be soft and non-sticky. If it is hard, add more water to soften it and if its sticky add a few tablespoons of rice flour. If you decide to make the dough and prepare the string hoppers later, rub oil on the dough and cover with a wet cloth to ensure that the dough doesnt dry out.